Within Teamwork Desk, you can enable automatic email inclusion for individual inboxes to add email addresses as CC or BCC to agent replies. Click your profile icon in the top right corner of your Desk site, and select Settings from the dropdown menu. In the Settings area, go to the Inboxes tab and select the inbox you wish to update. 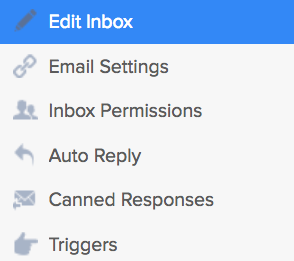 From there, go to the Edit Inbox tab, where you will see a section for Automatic Email Inclusion. Here, you can add email addresses you want to be automatically included as CC or BCC on any agent replies sent from within Teamwork Desk.